Unique and timely collection of papers of interest to the broad range of social scientists concerned with chronic illness & disability. 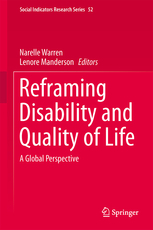 Discusses for the first time the lived experience and subjective wellbeing of people with medical conditions and impairments from a variety of cultures across the globe. Addresses the limits of psychometric measurement and the challenges in generating information about quality of life and wellbeing. This volume brings together two parallel fields of interest. One is the understanding among psychologists and other social scientists of the limits to psychometric measurement, and the challenges in generating information about quality of life and wellbeing that enable comparison across time and place, at both individual and population levels. The second is the interest among anthropologists and others in the lived experience of chronic illness and disability, including the unpredictable fluctuations in perceived health and capability. Chronic conditions and physical impairments are assumed to impact negatively on people’s quality of life, affecting them psychologically, socially and economically. While some of these conditions have declined in prevalence, as a result of prenatal diagnosis, early successful interventions, and changes in medical technology and surgery, many of these conditions are on the increase as a consequence of improved life-saving medication and technology, and greater longevity. ‘Quality of life’ is often used as an indicator for successful and high quality health services, and good access to medical attention and surgery – for hip replacements or laser surgery to improve vision, for instance. But it is also used as an argument against interventions, when such interventions are seen to prolong life for its own sake. Yet we also know that people vary their idea of quality as a result of the context of fluctuations in their own health status, the presence or absence of pain or discomfort, and as a result of variations in social and economic contextual factors. In exploring these questions, this volume contributes to emerging debates related to individual health outcomes, but also to the social and other individual determinants that influence everyday life. Understanding these broader contextual factors will contribute to our knowledge of the kinds of services, support systems, and infrastructure that provide people with good ‘quality of life’ and a sense of wellbeing, regardless of their physical health, capability and functioning. The volume includes scholars from all continents who have been encouraged to think critically, and to engage with the descriptive, methodological, social, policy and clinical implications of their work. Dr Narelle Warren holds a NHMRC Postdoctoral Research Fellowship to investigate trajectories of stroke and Parkinson’s Disease in European- and Indian-Australian communities. Her doctoral research explored the intersection of health, self-management and health-seeking behaviours and practices in an isolated community. More recently, she conducted a large study investigating how people adapt to a lower-limb amputation based in four hospital settings; this involved a detailed qualitative analysis of quality of life measures. Narelle conducts qualitative and ethnographic research into how understandings and experiences of chronic conditions vary according to gender, age, geographical location, and culture. In addition, she is a chief investigator in a study exploring how patients’ perceptions of preventive health change by sociocultural location. Lenore Manderson is Professor of Medical Anthropology at Monash University. Her interests include the anthropology of chronic conditions and disability, infectious disease in resource- poor settings, gender and sexuality, and questions of embodiment and identity. She was an inaugural ARC Federation Fellow at The University of Melbourne then Monash University. Under this prestigious award, she conducted research on chronic illness, disability, social relationships and well-being, including an inter-disciplinary multi-country study on social and cultural impact of chronic illness and disability in Australia and Southeast Asia. Through this study, she developed an impairment-specific quality of life measure, the PIPP scale. Previously she was Director of the Key Centre for Women’s Health in Society (1999-2002), and prior to that, from 1988-1998, Professor of Tropical Health at The University of Queensland. Lenore’s focus is on postgraduate training, and she has been internationally acknowledged for her commitment to mentoring and training of HDR students; she has supervised to graduation over 60 doctoral students and 40 honours and masters students working in the fields of public health and medical social sciences, in immigrant, Indigenous and majority communities in Australia, and in diverse settings in Asia and Africa. Half of her students are international. She has edited or co-edited 14 collections, and has authored or co-authored some 500 works in total; she is editor of the journal Medical Anthropology.